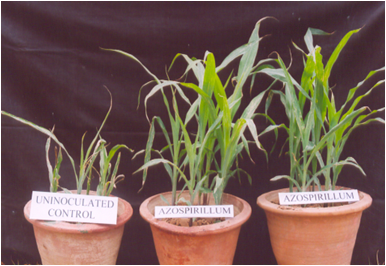 Enhances P uptake and yield of different crops by 10-35%. 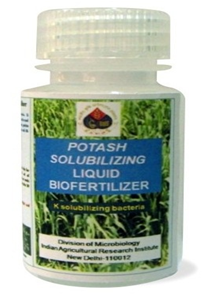 Liquid formulation of the phosphate solubilizing bacterial culture consisting ofPseudomonas striata. 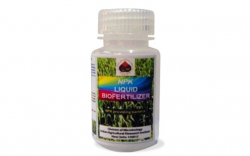 In general, 40% saving of superphosphate by application of rock phosphate and PSB biofertilizer.Enhanced shelf life for two years with viable count of 108 cfu/ml. 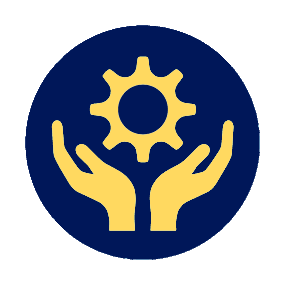 The other benefits are production of IAA and other growth promoting substances. 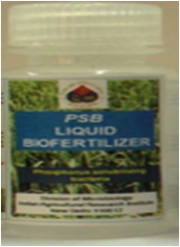 Liquid bioinoculant is cyst based and can be stored at room temperatures.It has a very high microbial load of more than 1012 cells /ml of Formulation has a considerably enhanced shelf life of more than 3 years as compared to 6 months of carrier based formulation. 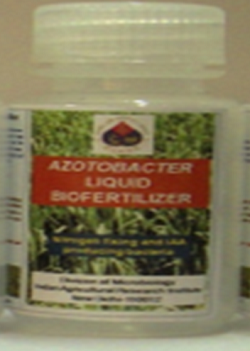 Azotobacter liquid biofertilizer can be used as inoculant for most of field crops viz. cereals, millets, vegetables, fruits, fiber and oil producing commercial crops. When applied as seed inoculant it can add 15-20 kg/ha nitrogen to the soil.The yield increases usually range around 10-35%.